Peru Authorities State They have begun Disciplinary Action against Jailers who photographed Suspected Killer Joran van der Sloot … How About Beinging Murder Trial of Joran Van der Sloot? Peru, stop acting like Aruba and get on with it already! The Peru authorities stated that they have begun disciplinary actions against those jailers responsible who photographed Joran Van der Sloot, the suspected killer of Stepany Flores. Peru, get your act together and stop acting like Aruba. The hell with disciplinary actions against jailers for taking pics … how about you start the trial of a murderer who has blood on his hands and a mountain of evidence against him in the death of Stephany Flores. Joran Van der Sloot, Hanging with his Homies … what happened to solitary confinement? Authorities in Peru said Tuesday they have begun disciplinary action against jailers who photographed suspected killer Joran van der Sloot posing with two other men held in connection with high-profile killings there. 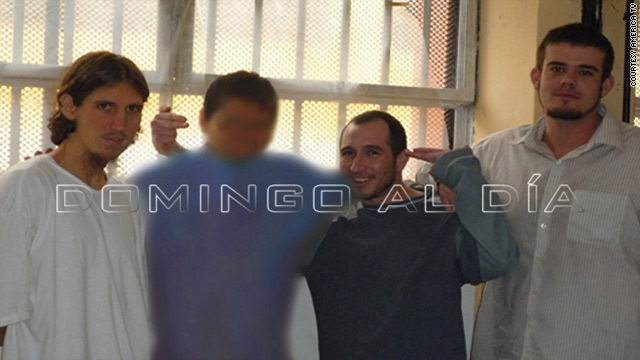 The photograph, first aired by the Peruvian television network America TV, shows the 22-year-old van der Sloot standing alongside fellow inmates Hugo Trujillo Ospina and William Trickett Smith II. A fourth man in the picture is not identified. Peru’s National Institute of Corrections said Tuesday that disciplinary action was in the works over the photo. Set free? How do you set free a person charged with 1st degree murder who is awaiting trial? Surely bail is not eligible to individuals who would flee the country who have been charged with murder? Who in their right mind let’s an individual who already tried to flee the jurisdiction out of prison when they are charged with 1st degree murder? What planet do we live on these days? I’m not sure why people are so freaked out about his confession being thrown out. They do NOT need his confession. They have enough FORENSIC evidence as well as circumstantial to keep this punk in jail and try him for murder. Waiting for the Appeals Court to rule on vdS’ appeal of his confession. The discipline of guards is nothing but a sideshow. How terrible for the Flores family to see this pic of her murderer laughing it up like he’s at a party instead of sitting in a jail cell on his murder trial. Jipshit is making a mockery of Stephany’s death and the Peruvian justice system with help from a Castro Castro jailer? This makes the Peruvian justice look like a joke, it’s a slap in the face to Stephany’s family & like spitting in the face of the victim Stephany. I’m sure her family is outraged seeing the brutal killer of their loved one smiling, laughing & showing that even behind bars he can still have a good time..just like he did in Aruba. I don’t care if he takes pics with his future lovers….let him be photographed 1 million times…as long as he’s behind bars where he belongs. I would rather see a pic of him in a casket to be honest….right after he gives up the info on where Natalie is. He looks like he is in better shape now than when he went in. It must be a better place than people say. He’ll be out in a couple of months. Those third world countrys are all just like Arubarb. A Killer’s Row photo if there ever was one. I wonder if their discussions are “how they did it.” If so, Joran might disclose details of Natalee to these guys. For some cash or leniency, they might talk. I say “yuck it up Joran”, the best is yet to come. He looks lost and sad to me. He’s trying to conjure up the usual smirk, but struggling. The guy on the left is scary! Hey Happster, Lost? Scared? How about “punk” and “in your face”? More like it. Looks like a camp for KILLERS. Peruvian BS about their prisons. If you got money then its party time for BUMS, and Killers. If they let Joran walk out? You will see Peru go into revolution. The Feds will have to arrest him on the extortion case. The second guy is probably a undercover cop. No, I don’t think he looks punk and in your face. I think he looks frail and weak. He doesn’t look like he’s having fun at that party. For once. Now the guy on the left..THERE’S yer punk in yer face dude. I thought Peru was gonna handle this one quickly..now he might walk? Well, we all know that would be no surprise. I really, really doubt it. I will bet any money he is one of the prison guards. As for #7… doesn’t seem sad ~ smug maybe ~ punk yes…~ clean shirt ~ well fed ~ the punks he’s with… nice chums to be posing with. Expose the guard ~ nice trophy photo to show your wife and kids… my job is so good! Look who I get to watch over! They’re my friends. These guys need a savior to save their horrid souls ~ PARTY!!! is what this photo screams. And for the dude with his arms around the guard… he da man. Yo yo. gimme a break. Can you imagine their conversations? Solitary confinement indefinitely ~ put them in the hole… that will make them miss their punk-show buddies. I pray for the Flores & Holloway Families. cryin’ they won’t give me a razor, cause I’ll hurt somebuddy. They should at least be allowed to take a picture of the wedding ceremony. Hopefully a planet wehere rule of law still applies and wehere someone is presumed innocent until proven guilty. Does it never happen in the US that a confession is thrown out of jail? or that a murder suspect is out on bail?? Maybe there is enough forensic evidence, it remains to be seen, but there is a lot of things that do not add up in this case. As for Joran ~ he admitted killing Stephany and Natalee. Please explain Ed, what doesn’t “Add up?” just curious ~ it seems to be a very clear math equation. please let us explore that with you. Nothing, but nothing surprises me anymore when it comes to money, and who has the best attorney. Oh, yes, and did I mention the money? Joran has admitted to killing Natalee and Stephany. By his own confession, he is a double murderer. With Stephany, it was with extreme violence and we don’t know what happened with Natalee. What more does it take? He does not deserve to walk the streets in any country. Turn him loose in Peru. He won’t survive three minutes. Same would be true with the GP in Castro Castro. No matter what, he is a dead man walking and he knows it. Money and really good attorneys won’t make any difference. One thing for certain, he will not live to see 2012. You are in the wrong chat room. Joran has confessed to two murders. Are you an idiot or an Aruban (oops sorry, I guess it’s the same thing)? You should move to the “I love Joran” room. Unfortunately many of Joran’s prison buddies are already in line so you will have to wait your turn. One thing for certain though, it gets looser as time goes on. Ooooooooohhhh… I don’t think the Little Sporter is eating that well…..he has definetly lost some wieght. A few of the posters are right on—-he is not going anywhere. Joran VDS is a DEAD MAN WALKING. Doesn’t matter about some dumbass pic with his Homies in that shithole either. Look where he is. The second he steps out of those prison doors (if he makes it that far which is highly doubtful) Peru will riot around him. Tell us where you put Natalee’s remains before they off you, you little B*tCH! Evil Monster. You know you are really screwed when even your own Mother cuts you off for good, Joran. She was in denial for the longest time- but even she has finally admitted the truth. You and your dead Father, along with the Kalpoe rapists know where you put her. Anita was not back yet to the island the night you all had your little meeting and discussed the plan to tell LE and the Holloway Family. I think while Anita knew some things, I am willing to bet that neither you or your dead Father ever told her what you really did either. Just like the media, you told your own Mother and the whole world lie after lie after lie to cover up all the corruption on that stinking Island. You murdered Natalee and Stephany, you POS and on top of that, you also were in the human trafficking trade. You are EXACTLY where you belong! Viva Peru! Send in the Thuggs to slice his throat and get it over with already. Joran is in jail in Peru. Peru follows Napolenoic Law, guilty until proven innocent. There is no trial by jury. A three judge panel decides his guilt, and it only has to be two of three. If his confssion is thrown out, it will be to his detriment as there is a benefit to a confession. In any case, he will likely face life for murder with intent to commit robbery. If there is doubt in your mind about Joran’s guilt regarding Stephany, you are either blind or stupid. Ed has a problem with 2 people into the room, 2 people out. Except one of them on the way out is dead. That is a simple math problem to me but Ed doesn’t think it adds up. I guess he can’t count. ed’s absolutley right.natalee and stephany were both within a hundred miles of him,come to think of it so were those 2 girls in thialand.proof? there’s video tape of all those girls being with in a hundred miles of him.that includes the 2 in thialand.the nerve of people jumpin to conclusions.GO TO IT ED,give ‘em heck.guys like you and me know better,don’t we? in fact to prove joran innocent.his legal team should present all those video’s of him ,in the presence of all those missing girls in the previous post. of course,if they don’t.the procecution could,I guess,either way,I’m sure the judges will look favourably on this evidence.THANK-YOU ED.Your words probably just turned this case around.HA-HAA-HAA. someone has “cashed” in on the photo… at the supermarket today, it is front page of the sleezy tabloids, front and center. oh, I can’t resist… for Krieton ~ is it pronounced like the word, creaton? Missing and exploited girls are nothing to laugh about ~ neither are dead ones, creaton. krieton is on your side. But Ed has been noticeably absent. Guess he couldn’t stand the heat so he ran out of the kitchen. I am sure he couldn’t man up to the idea of your suggestion to explore “it doesn’t add up” with him. I think he was related to the Natalee case, like maybe he is one of the Kalpoes. I am sure he is from Aruba. I thought kreiton was on your side. Now I don’t think so anymore. thanks for setting me straight Frederic ~ sorry Krieton. Misunderstood reading post. my prayers are with our friend & the Flores/Holloway families. Way too young to loose such vibrant ~ loving positive contributors to society. Except I think I misread krieton’s intent. I think he is either a Kalpoe or a van der Sloot. Maybe he and Ed are the same person. At this juncture ~ 2 girls are still gone, perhaps more ~ by the hands of those doing evil. And there is a killer still alive and having fun in the Peruvian prison system. I hope he likes his environment. He’s only got about 70 more years of it. Maybe some time off for good behavior like giving the guards a BJ. I think he is close to being resigned to the rest of his life incarcerated. Joran of course could re-explain exactly how he harmed these girls ~ that which to he confessed to already. Not to mention extorting money. It doesn’t take a rocket scientist or a forensic scientist or a mathematician to figure out the answer. Curious minds would like to know Krieton, what you and Ed seemingly “know better” about? Joran was in physical contact with both girls. That’s closer than one hundred miles. Both girls are dead. How come I saw Joran Dec29, departure at 7:45am 2010, at the Aruba airport waiting to go thru customs? When I got on the plane which was going to Miami, he was sitting in first class. Does he have an identical twin? Is this Peru jail stuff all made up to get the media off his back? I suspect that his father is still alive as well, although I did not see him on the plane. He is probably helping to arrange the prisoner swap program which is underway between the Netherlands and Peru.The foreign ministers of the two countries agreed that Dutch prisoners in Peru and Peruvians jailed in the Netherlands can apply to complete their prison terms in their homeland once their appeal process has been completed.